Why hello there my fellow Disney/Universal/Orlando lovers! I'm back once more talking all things holiday and excitement! If you didn't know already I am heading back to my motherland in March ready for another amazing holiday full of Mickey, Harry and everything in-between! I'm always asked so many questions when it comes to Disneyworld etc, especially from people booking their first trip or wanting to know what's best to do, wear, pack - so I thought it was about time I wrote yet another post on the magical land of Orlando and how you can make your trip that little bit easier, better and cheaper! So, here's five things to do before you get on that plane! As annoying is that is - it really is better to have one, even if it's a vague basic idea of what you're going to do! If you're staying at a Disney hotel I would highly advise heading to the parks with 'Magic Hours' each day - that extra hour in the morning really is amazing for avoiding huge queues and getting on those rides maybe you wouldn't be able too in normal peak times. When it comes to Disneyworld - booking dinners and Fastpass's is also essential! Again, if you're staying at a Disney resort hotel this is easy - just get the My Disney Experience app and you can book your meals 6 months in advance and your fast passes 90 days in advance! This sounds crazy but it is a must, you won't get into Be Our Guest unless your booked - I booked ours last week which was 6 months in advance and there was only 3 dinner times to choose from! When it comes to Universal the way that works for us is starting at Islands Of Adventure, getting there about 45/30minutes before the gates open and queuing then going straight to Hogsmeade (yes... we've been known to run) - doing everything there and then working our way back down to the Marvel area before getting the train over to Universal Studios! I CANNOT tell you enough to buy.your.tickets.before.you.go. With our booking our Disneyworld tickets were included but if you are planning on staying in an apartment/villa/off Disneyworld property then you 100% need to buy your 2 week/1 week tickets before going! This is the same with Universal - buying a 2 week pass here in the UK is SO SO much cheaper than even trying to get a two-day pass once in Orlando! The perfect place to do this is Attraction Tickets Direct - check them out for all your ticket needs and save yourself the money and the stress of paying full price on site! This is probably an obvious one and a tiny detail but make sure your journey from landing to your new bed for the next week or two is seamless! 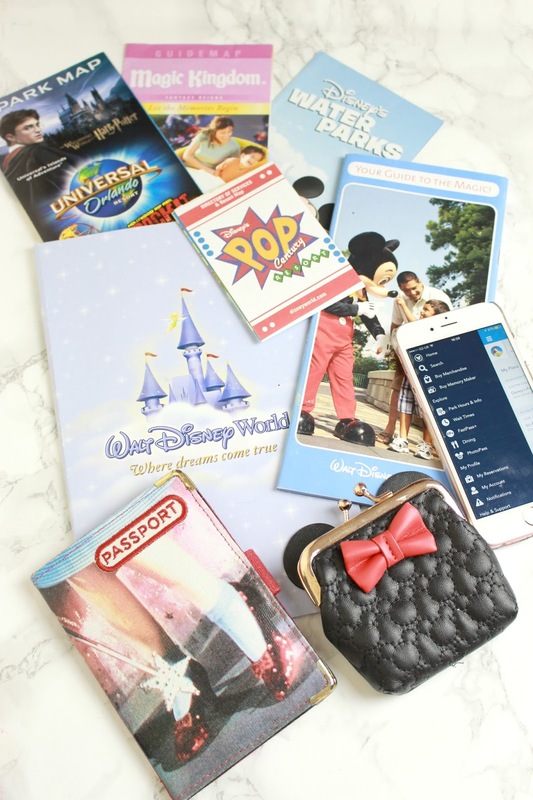 If you're staying with Disney this is included with Disney's Magical Express which drops you to your hotel from the airport on a fun-filled coach BUT you do have to confirm your place on these - so make sure you have that sorted before you jet off! Probably my number one piece of advice - the right shoes and bags can make or break your trip! For me trainers are probably my number one go-to footwear for walking round the parks all day! (and luckily they are in fashion right now!) You are on your feet alot so flip-flops, unless super comfy, can be a pain! Aswell as comfort, trainers are a little bit more secure for when you are on big rides at places like Universal... no sandals flying off half way round! Bags are also a big thing for me when I'm away - with posing for photos, grabbing your phone and wanting you hands free at all times a handbag really isn't the one - I like to go for a cute across body bag and my boyfriend usually takes a backpack for us both to pop in extra clothes and snacks! Yup, it's true you're going to need money - and if you want to have a relaxed vacation, not worrying about each and every purchase, it's always better to save too much than not enough! Obviously seen damn Brexit the exchange rate hasn't been as fantastic as it was but maybe it will improve soon.. who knows! On our last trip my boyfriend and I took $3000 ... yes this might seem like alot but we didn't want to have to think too much about the money we were spending! We work hard so why not? This was $1000 each to buy/do what we wanted and also $1000 for our food, wallmart trips, dinners out etc. I hope this has been some help to some of you - if you enjoy these Orlando/Disneyworld posts do let me know! I've never been but think Magic Hours sound like an amazing idea. Would love to go so getting massively jealous. Couldn't agree more with the fast past!